Orange juice adds a burst of citrus flavour to a yellow cake mix. Baked in a tube pan, this luscious cake is dusted with icing sugar before serving. Beat all ingredients except icing sugar in large bowl with mixer until blended. Bake 35 to 40 min. or until toothpick inserted near centre comes out clean. 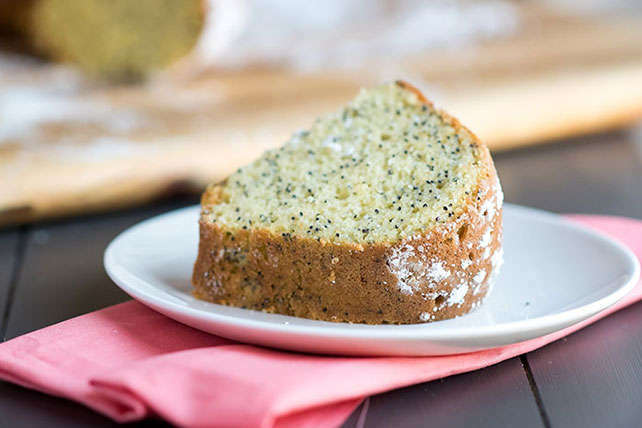 Cool cake in pan 10 min. Loosen cake from sides of pan with knife. Gently remove cake from pan; cool completely. Sprinkle with icing sugar just before serving. Omit icing sugar. Prepare cake batter as directed; pour into 2 greased and floured 8- or 9-inch round pans. Bake in 350°F oven 30 to 35 min. or until toothpick inserted in centre comes out clean. Cool cakes 15 min. Remove from pans to wire racks; cool completely. Fill and frost with your favourite icing. Prepare cake batter as directed; pour into 13x9-inch pan sprayed with cooking spray. Bake in 350°F oven 35 to 40 min. or until toothpick inserted in centre comes out clean. Cool cake completely. Sprinkle with icing sugar just before serving.